Stand with feet hip with apart, arms at your sides and gaze forward. Inhale- Arms overhead and parallel. Gaze up. Exhale- Keeping your arms extended up and parallel, bend your knees. Lower buttocks as if to sit in a chair. Chest is lifted. Gaze forward. Inhale – Pressing soles of feet into the mat, straighten the legs and reaching up overhead with the arms. Exhale – Bending at the hips, lowering the chest to the legs. Hands along front of legs or placed on outsides of feet pressed into the floor. Exhale – Hands to the floor alongside feet, step feet straight back into plank. Then slowly lower the body down with elbows in at the side, until the body is parallel with the floor. Gaze is forward. Inhale – Push up and over the toes so that the tops of the feet are flat on the mat. Arms and legs are straight, lifting the chest and thighs off the mat. Gaze is up. Arms lengthen, palms pressing on mat with fingers spread. Gaze at toes. Inhale – Gaze at the hands. Jump the feet between hands. 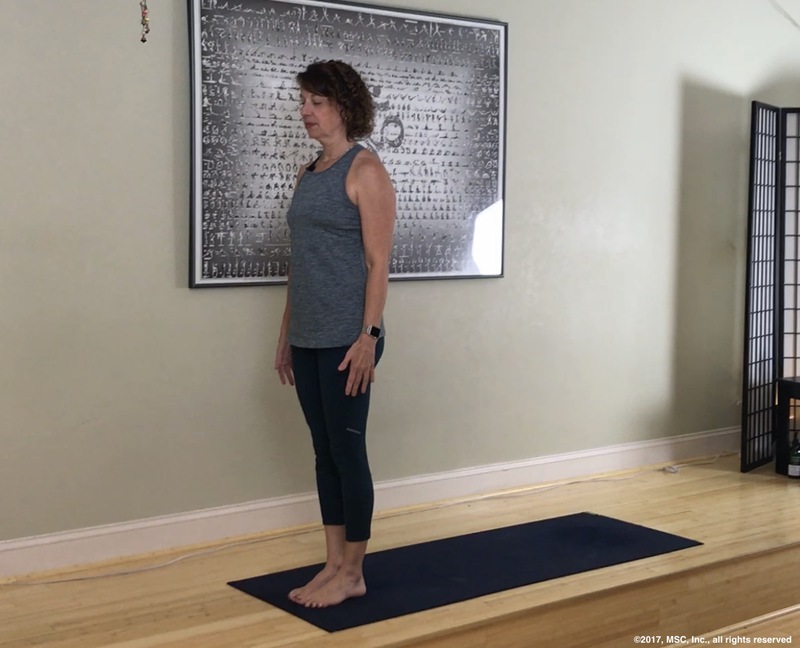 Inhale – ½ way up with hands at shins or thighs lengthening the spine. Step right foot up approximately 4 feet apart from left foot. Right heel in line with the instep of the left foot and then left foot turn slightly out away from the right heel. Hips turned toward the right leg, chest lifted. Inhale- Arms overhead and parallel with shoulders down and back.